People have been producing ethanol for about 9000 years. Ethanol is made using a fermentation process. The fermentation process converts sugars into ethanol using yeast. For most of history, the ethanol produced was for consumption purposes. In the last 35 years, there has been an increase in ethanol fuel use[ii]. Currently, ethanol fuel is produced in more than 200 ethanol plants throughout the US[iii]. In any ethanol plant, the goal is to consistently produce high ethanol yield and limit the batch-to-batch variance. Anne Chronic of Phibro Ethanol Performance Group, a division of Phibro Animal Health Corporation, recently presented at the International Fuel Ethanol Workshop & Expo (FEW) on how JMP can be used to help accomplish these goals. Anne’s talk, called “Finding Your Rock Star Operator,” focused on a specific case study. In the case study, the plant was targeting a specific process called Clean In Place (CIP). The CIP process is used to clean out process tanks and piping on a routine basis. Anne discovered that the different operators had a wide range of performance. 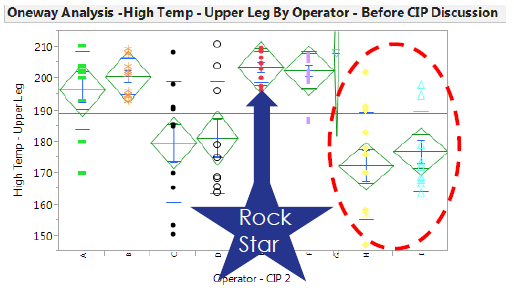 She found that one was a “rock star” operator, while the others were not performing as consistently. After Anne discovered the trend, the results were communicated back to the plant. The plant then had a discussion about CIP with all of the operators, emphasizing the importance of following the standard operating procedures for CIP. The CIP process often requires recirculation of water (and/or chemicals) and time to reach high temperatures needed for adequate cleaning. The operators who were not performing as consistently had been attempting to save time and water (and/or chemicals) during CIP; they did not realize that doing so was affecting the rest of the fermentation process. After the CIP discussion took place, the plant saw an increase in the overall temperature and a dramatic reduction in variance. To summarize the results of the case study, Anne used the Partition platform in JMP to show the improvement by the operators after the CIP discussion. The ethanol fuel industry is very dependent on yield and reproducibility. Even small improvements in yield lead to substantial profits. Several talks at the FEW conference mentioned that a 0.1% yield improvement can equal ~$50,000-$500,000 annually, which highlighted the large impact that JMP can have in analyzing and visualizing ethanol fuel industry data. Gately, Iain (2009). Drink: A Cultural History of Alcohol. New York: Gotham Books. ISBN 1592404642. [ii] Renewable Fuels Association (6 March 2012). "Accelerating Industry Innovation – 2012 Ethanol Industry Outlook" (PDF). Renewable Fuels Association. Retrieved 18 March 2012. See pp. 3, 8, 10 22 and 23.